And it was to not get a tattoo of the word “squad,” misspelled, from a possibly drunken cast mate. This is an excellent choice. What was your most memorable day on set? Getting my tattoo from [co-star] Margot Robbie. We were hanging out one night at dinner, and we said, “We should all get matching tattoos.” And she was like, “Yeah, let’s do it.” She came in on one of the shooting days and brought her tattoo gun in her trailer, and we all filed in and gave each other tattoos. Will [Smith] didn’t [get one], but he was definitely down with it. Mine is on my ankle. It says SKWAD. 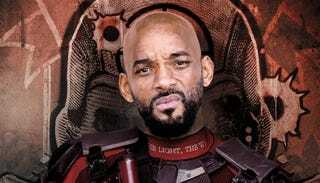 Which means, if both this photo and Fukuhara are correct, Will Smith managed to tattoo a co-star but avoided being tattooed in return. Well played, Will. Well played.